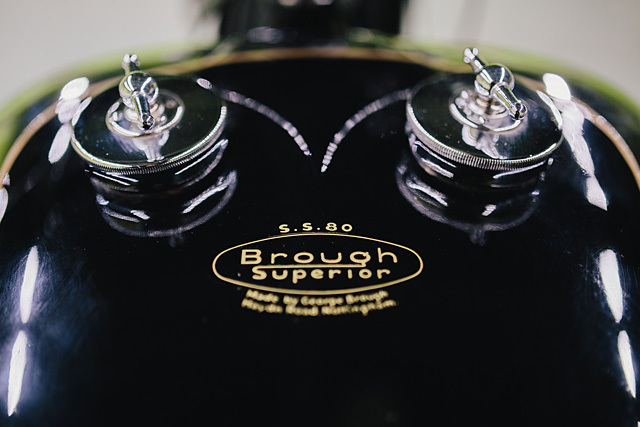 In 2016 Brough Superior are probably best known for being the motorcycle company of choice of the legendary Lawrence of Arabia (T.E. Lawrence) and the record-breaking prices these machines now fetch at auction. To the vintage motorcycle enthusiast they are the holy grail, the companies run of motorcycle production from 1919 to 1940 producing two of the most sought after bikes in history and a legacy that lives on in Brough Superior Clubs, an endless array of hard cover books and the spectacle that occurs when any Brough comes up for auction. 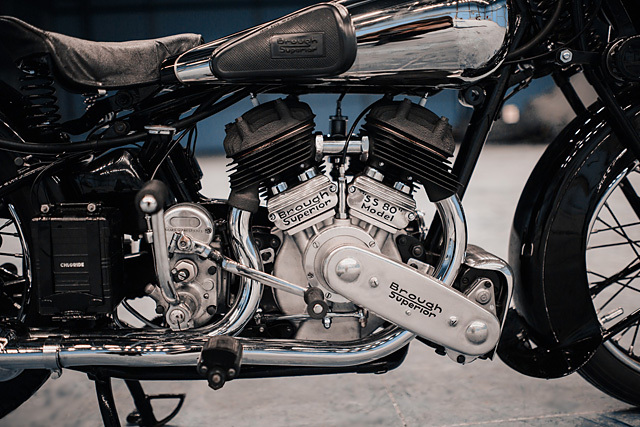 But all that has been said before, what is rarely discussed is the role George Brough and his motorcycles had on the custom scene and the lessons he left for future builders. 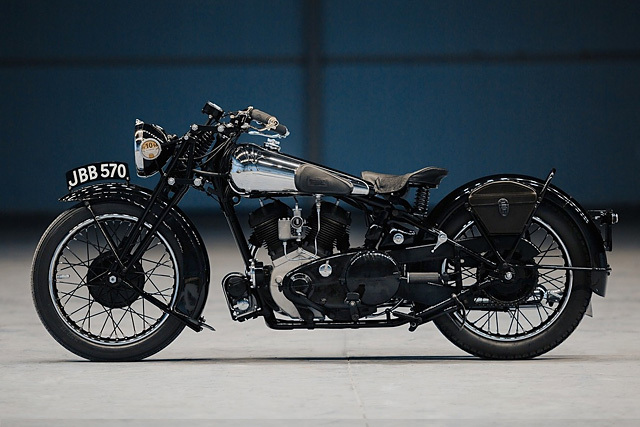 So from the collection of The Motorworld by V.Sheyanov, let’s take this rare 1940 Brough Superior SS80 Special around the block and see what we can learn. 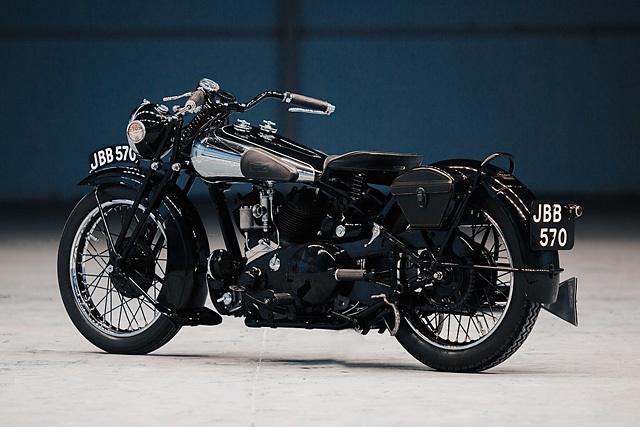 George Brough was first and foremost a motorcycle enthusiast and it’s easy to see why growing up with his father the head of his own motorcycle company pioneering the early days of the two-wheeled machines. But young George was a petrol head and racer who spent years trying to convince his Father to build more performance orientated machines, the likes of which the world had never seen. 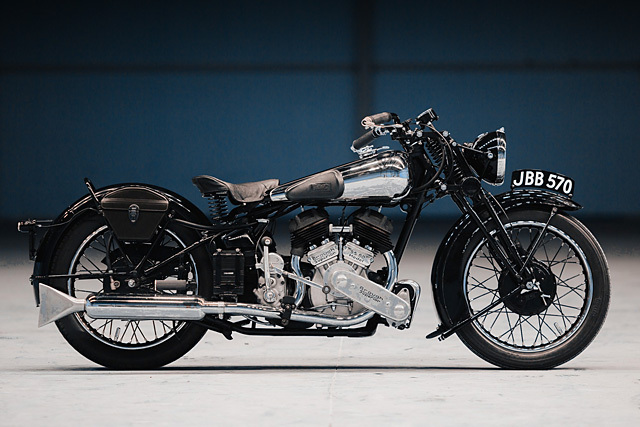 But his conservative Father was not convinced and so George opened up his own factory in Nottingham nearby to his father’s own, only with a slight change to the Brough name; George would call his company “Brough Superior”. You’d have to think that made Christmas lunch a little awkward from then on and his old Dad didn’t take kindly at his sons subtle dig, but as much as he was a show man, George could back up his boast! 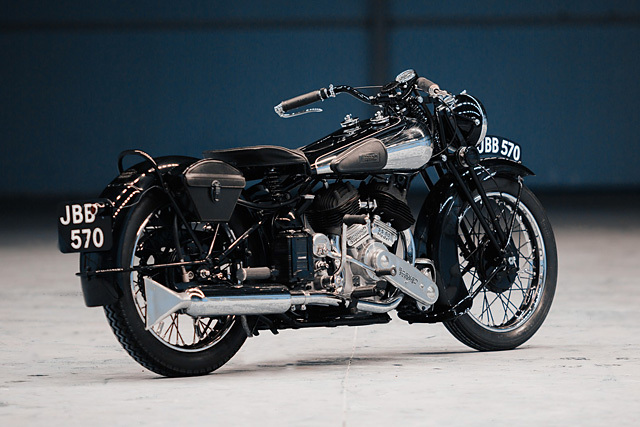 Take for example this model, the SS80, it doesn’t get its name from having 800cc or a designation that followed a numeric order. It comes from the fact that even in 1924 George guaranteed that his customers would be able to achieve a thunderous 80mph or their money back! This was an easy claim to make as George had used an SS80 he nicknamed ‘Spit and Polish’ (so-called because of the immaculate finish he always maintained) to become the first sidevalver to lap the Brooklands track at over 100 miles per hour (161km/h). 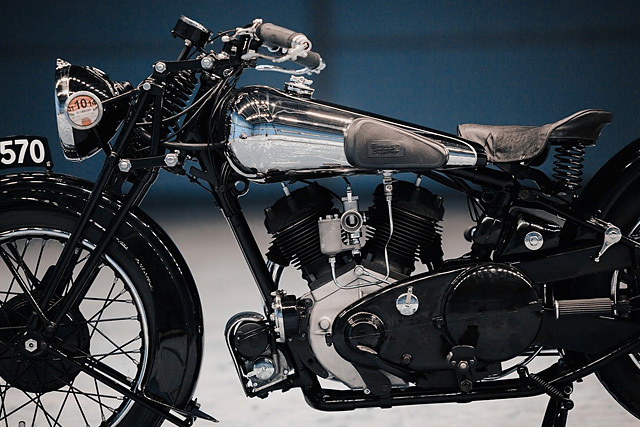 Despite being a motorcycle company, Brough Superior had far more in common with the custom workshops of today, right down to the names like “Spit and Polish”. No two bikes were the same, although based on largely common platforms each bike was different and largely built to the customers desires. 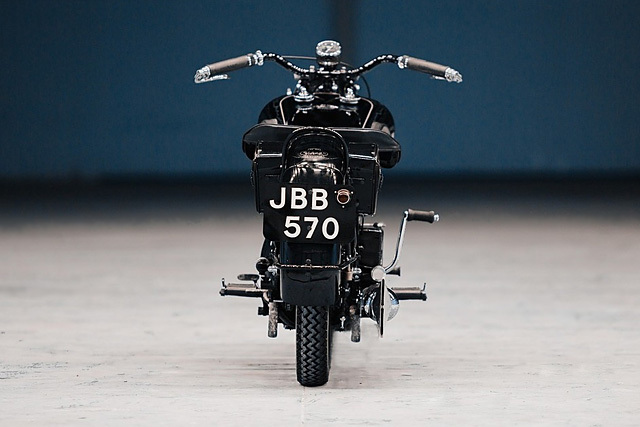 Another aspect of his production that is common to the modern customiser was the way he built his bikes. 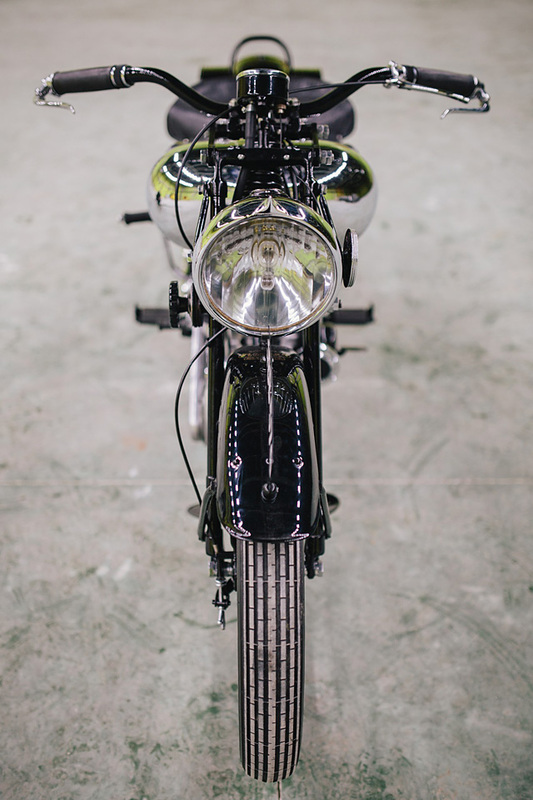 There was no production line with common parts simply attached, each bike was assembled before being stripped down for paint and polished and then assembled. Along with his own components he used the Ohlins and Brembos of their day to create his Superior machines. 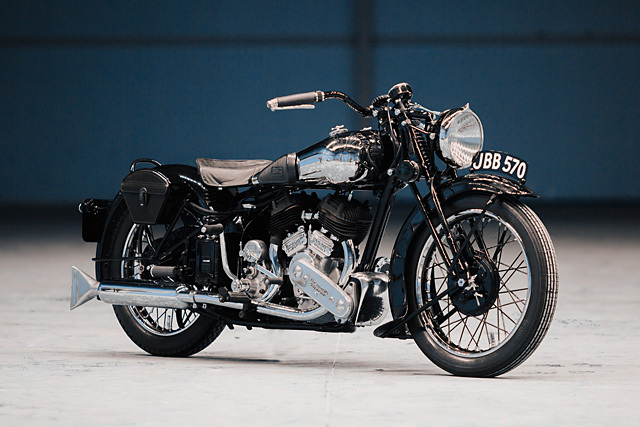 There were at least four types of front end used on the SS80, on this particular machine are a set of Brough’s own forks, with a centrally located compression spring designed for rougher more arduous journeys and a rigid rear, although the De Luxe model offered a sprung rear. The engines were no different, George wanted a unit that would not only meet but exceed his customers expectations of speed and reliability. Early models of the SS80 used the 988cc J.A.P. sidevalve engine, but seeking an even more reliable and quieter operating engine in 1935 Brough switched to the Matchless V-twin side-valve, a 50degree 982cc fitted with many of his own parts like big side valves, totally enclosed and automatically lubricated, oversize roller and ball-bearings throughout, detachable cylinder heads, and full dry-sump lubrication to all moving parts. Like customisers of today he took good engines from what the big manufacturers had to offer and then made them that much better. As the last of the SS80’s were being built, 460 of which featured the Matchless engine, Brough made this promise even as he lowered the bikes pricing “Despite the price at which the “S.S.80 Special” is marketed, I am prepared to guarantee the materials and workmanship throughout this machine to be identical with the remainder of the Brough Superior range, and also justify what “The Motor Cycle” said of the original S.S. 80 model : “The Rolls-Royce of Motor Cycles”. The Rolls-Royce like praise was even official when George was given permission by the Auto giant to use the nickname in his advertising. It was easy to see why, the famous tank, assembled from as many as twelve pieces of metal was beautifully soldered together by craftsman of George’s choosing, usually requested with a painted upper and deeply polished sides that neither scratched nor corroded despite the harsh English conditions. The seats too were Rolls like luxury with comfort and style a priority for these performance machines of their time, sprung and with the best of leather stitched over the top, most were shaped for the individual client. The patented “Loop” frame was also vital to the success of the SS models, the precision in design and construction meant it was precise at both high and ultra low speeds, a rare achievement at the time. The four-speed box with enclosed primary was so smooth that you could make clutchless shifts without a worry in the world and the 8inch brakes had tremendous stopping power. So confident was Brough in his creation the sales brochure made such claims, backed by guarantee “It is a very satisfying to know that you are astride a machine which, if you wish, can leave behind anything on wheels. It is actually possible to ride hands off at 60mph. It starts first or second kick stone cold. It will tick over like a high-class car at speeds as low as 10 miles per hour on top gear. It can be circled round in the road inside a 12ft circle with both feet on the foot rests.” All of this in the 1920’s until the start of WWII put an end to the production run of SS80’s that with George himself on board won 50 straight races until a punctured tyre ended his unbeaten run. The life and death of T.E. Lawrence aboard an SS100 (One of eight Brough Superior’s he had owned) no doubt adds to the brands legacy and legend but the sheer quality of the machines, their performance and perfect construction meant they were years ahead of their time. George’s ultimate lesson to customisers today is simple, take absolute pride in what you do, but don’t be so proud you won’t use the best components available even if made by others and never compromise on quality. 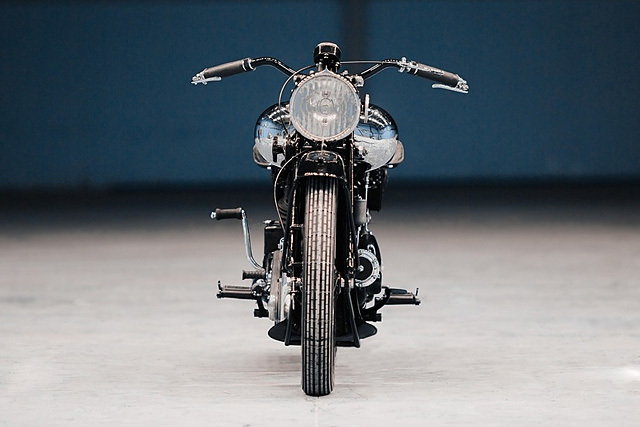 Because to build a bike that is truly superior, requires the absolute best of everything and that includes you, the one in your workshop, back shed or garage spinning the spanners and spending the long hours to get your bike, just right!